Can a Chiropractor help with Neck Pain? Neck pain is one of the main problems cared for at Innate Chiropractic. 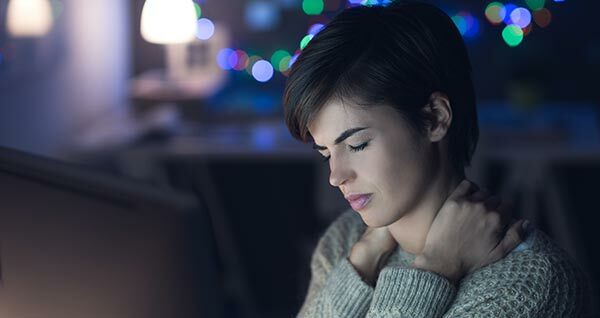 With today’s lifestyle bringing lots of sedentary activity such as long hours of sitting at work, or continuous hours of driving and even less people getting enough exercise – it’s no surprise neck pain is so common. However, this doesn’t make it normal. The neck is made of the cervical spine. There are 7 cervical vertebrae bones, with associated cervical discs, many muscles, ligaments and nerves as well as other soft tissues. Neck pain can have a sudden onset and be quite severe. Or it may come on slowly, getting worse over time. Neck pain comes in a range of pain levels from mild to severe and can often cause tension headaches and even numbness in your arms and hands. Nerves in the neck communicate with your brain and coordinate the muscles in your neck, arms and hands. Common symptoms of nerve irritability can be neck pain, which can also include your shoulders, back, arms and even your hands. Because these nerves coordinate neck muscles, neck stiffness and pain can be a common ailment. A group of muscles at the top of your neck called the sub-occipitals is considered to be a main cause of tension headaches and neck pain. With Chiropractic care you can help prevent this pain from reoccurring. Innate Chiropractic will examine which one of your cervical vertebra is not moving right. This is done through a technique called motion palpation. Neurological assessments are also performed to determine if radiculopathy is present due to nerve compression or irritation. You may also have some radiological imaging to check for any biomechanical, congenital or pathological reasons may be causing neck pain. Your Chiropractor will put all of this information together and along with your history make a care plan tailored for you. The neck is made of the cervical spine. There are 7 cervical vertebrae bones C1 to C7, with associated cervical discs, many muscles, ligaments and nerves as well as other soft tissues. Each vertebra contains a pair of spinal nerves that run from the spinal cord and travel away from the neck joints called facet joints. These are the joints that enable you to move your neck. If any of these joints cannot move normally and lack joint mobility, this represents a mechanical joint dysfunction. Common neck pain caused by mechanical joint dysfunction which will inevitably lead to scar tissue deposition, soft tissue adhesions, inflammation, degeneration within the spinal facet joint and altered sensori-motor neurological function as a result. The pain can be mild to very severe. Innate Chiropractic provides gentle and specific chiropractic adjustments applied to your neck joints that will help restore natural joint range of motion. This will take away nerve irritation and the pain. Care is ongoing for some time, not only to relieve symptoms, but to help prevent an inevitable return of chronic joint dysfunction, nerve compression & irritation, pain and a build up of muscle tension. Innate Chiropractic practices with a biomechanical approach using the latest and most advanced technology combined with our extensive knowledge of the surrounding anatomy to assess and provide neck care in order to help improve your neck pain, cervical spine health and function.